no A-lister worth their salt can miss a shot of themselves entering its gilded art deco doors after a day spent shopping in the Golden Triangle. They’ll have their personal assistant take shots of them sprawling among the hotel’s extravagant flower displays – a team of nine florists arrange 15,000 freshly-cut Dutch blooms every month – or perhaps next to the hotel’s museum-worthy art collection, crystal chandeliers and 17th century Flanders tapestries. They’ll dine at one of the three restaurants which share five Michelin stars among them; enjoy wine from the George’s V very own cellar; take an invigorating lap across the spa’s 17m pool, or indulge in a traditional Japanese face lift for the perfect pre-beauty-sleep treatment. The wine cellar represents one of the hotel's prized possessions, a well kept secret carefully concealed which opens on demand for exquisite private tastings. The hotel's newly renovated spa. A 720 sqm temple of wellness in the midst of Paris' Golden Triangle, boasting a 17m long swimming pool and the best place in the city to book yourself a Kobido treatment. The Hotel organizes various complimentary activities for its clients : "Run my city" and "The Flower Class" by Jeff Leatham. It was a wonderful weekend, with courteous and efficient staff all the way from doormen, to waiting staff, to room service. It was magnificent- especially with all the holiday decorations. I felt like a Queen staying there. It's for sure the best city hotel in the world. Especially the bar service as well as the door men are unbelievable! It's the absolutely professionality with the touch of humor we loved mostly. Great stay every time !! The hotel is superb. However, I only learned that the Cinq Restaurant was closed during August after we arrived at the hotel. To make up for this the hotel provided us with a superb complimentary lunch and visit to the cellar, with all stops removed to make it a memorable meal. This was arranged by the F &amp; B manager. The lunch service managed personally by the Cinq maitre d'hotel who personally waited on us was nothing short of magnificent. Generally the staff at the hotel cannot do too much for the guests indicating a superb group of front-line workers and management from top to bottom. Congratulations! The Four Seasons George V is an absolutely lovely hotel. Beautiful flowers, lobby, courtyard, and a glorious spa. Absolutely perfect location. The hotel check in service was very helpful and L Gem was able to secure an upgrade to a lovely Suite. Thank you. Very good concierge service booking my restaurants. Beautiful hotel Staff very courteous Only glitch was tv in room didn't work for a while. Property out of this world. Will go back for sure! Lovely hotel with beautiful communal areas. Rooms are of a good size and the staff are very welcoming. It is a magnificent hotel, with a beautiful floral decoration. The staff is competent, kind and attentive. The quality of the restaurant is excellent. This is an exceptional hotel with a refined luxury. Our stay at the George V has been perfect. We cannot fault any area. The hotel is visually stunning, the upgraded room was lovely but the best part of our stay has been the exceptional service we have received throughout the hotel. All staff could not have been more accommodating and charming. A truly memorable stay. Simply the best hotel in the world. I have no criticism to make of it or it's staff. A true &quot;Palace&quot;. Reputation well deserved. For sure one of the very best hotels in the world. would come back anytime! An outstanding experience, with extra special treatment for my wife for her birthday which was extremely thoughtful. Very good hotel. Thanks for the upgrade, it is highly appreciable. Thank you for your professionalism, there are no surprises or only good ones! Again congratulations to your team. A dream vacation in a magical place where luxury blends perfectly with refinement. If there are hotels where it is difficult to ask more, the George V is clearly part of them. Great service provided by Grand Luxury Hotels. I will definitedly use it again for my trips to come. George V is superb. This is the first time I have booked with Grand Luxury Hotels and the whole experience exceeded our expectations. The choice of hotels is excellent and we were delighted with the Georges V. We received the room upgrade, we used the breakfast and spa vouchers and paid on checkout exactly what we expected to. The concierge service was great - we had champagne in our room for our birthday, restaurants were booked for us (and confirmed by the hotel). All in all a great first time. This hotel is one of the 5 best in the world. One word: excellent ! 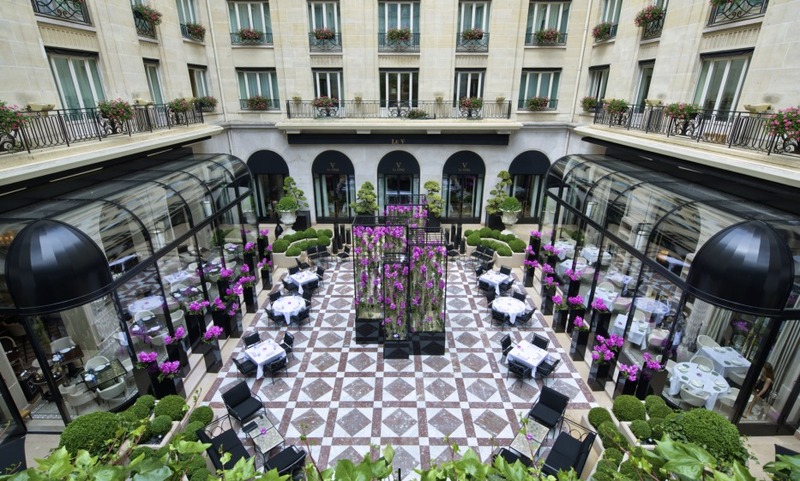 The reservation process was very easy with Grand Luxury Hotels for the Georges V: efficiency and superb benefits with an upgrade to a beautiful suite, a 100 euros voucher for the spa, and breakfast included. The hotel is exceptional with a superb floral decoration! A dream vacation in a city of dreams ... thank you to Grand Luxury Hotels for the quality of its services, including its concierge! Thank you to George V for its outstanding hospitality, service and comfort! We have never experienced a staff as friendly, available and courteous ! A dream holiday in a beautiful setting! A warm welcome and Irealy felt like living a fairy tale! Not to mention the fact that it is much more difficult to leave this place than to get into it because it so perfect ! Superb hotel, excellent service, and very kind, very attentive staff. With Grand Luxury Hotels, we were able to receive some additional services for my wife's birthday (a bottle of champagne and a cake in the room). Thank you! The stay at the hotel was fantastic. You feel as if you are looked after all the time in a very discreet but kind and efficient way by very professional and well trained people.